It’s not every day an opportunity arises to meet a Harpy Eagle. One of the world’s most majestic raptors, this species has long been an iconic symbol of rainforest and tropical environments and conservation. As habitat destruction continues throughout tropical regions, the urgency to protect such keystone species continues in the hearts and actions of conservationists worldwide. For a birder, the opportunity to see a Harpy Eagle is an unforgettable experience. On June 30, Canopy Tower guide Carlos Bethancourt and the Cheepers! Birding on a Budget group found a young sloth on Semaphore Hill Road below the Canopy Tower. Carlos took the sloth to Summit Municipal Park for care. While there, he learned that Summit Park had recently received a rescued Black Hawk-Eagle (Spizaetus tyrannus) from Bocas del Toro in western Panama and a young Harpy Eagle (Harpia harpyja) from the Darién—both in the past few days. Nestor Correa, the director of Summit Park, met with Carlos and invited the group to visit a little later in the week to see the new eagle. On July 4, Carlos, Cindy and Jim Beckman, owners of Cheepers!, Kim Kaufman and 10 birders from the U.S. who were staying at the Canopy Tower for the week visited Summit Park for the meet-and-greet with the young Harpy Eagle. Upon arriving at the park, the group was thrilled to meet two baby Hoffman’s Two-toed Sloths, who were found in the area and dropped off at the park. Under constant care by Nestor’s wife, these young sloths (only 2 and 3 months old) will hopefully grow strong and healthy and can return back to their natural habitat. Nestor gave us an informative introductory talk about Summit Municipal Park and Botanical Gardens, including the history of the park and its role in animal care and wildlife rehabilitation in Panama, as well as conservation and education. In addition to the wonderful staff, Summit Park would not have the success it has today without the help and support of dedicated volunteers that come from all over the world, for short or long stays, as well as local groups and companies that visit regularly to help where they can. On our visit, a staff group from Dell Panama was working hard to help with property maintenance and construction. They come once a month to volunteer their time and handy work. Furthermore, Summit Park has several volunteer “mothers” who dedicate their time to raising young animals that are dropped off at the park—mainly sloths, tamanduas, monkeys and other animals that require care 24 hours a day. They spend their days at the park, and bring them home every night for attentive care and required feedings every few hours. After the introduction, it was time to visit the new Harpy Eagle. We approached a large enclosure, where they can house animals out of view of the public. She was confiscated from a community in the Darién, and has been living among people for the past 2 months. As Nestor continued to tell us about her, “Choco”, as she is called (after the region she came from), sat contently as we admired her size and beauty and snapped great photos. Nestor entered her pen, and even when just several feet from her, she remained calm—it was apparent that she is not afraid of humans. He gathered the remains of her food from the previous day, which consisted of rabbit meat. They monitor her and all the animals very closely to watch for changes in feeding behavior, which could indicate conditions of poor health or stress. Since she is non-releasable, the staff at the park will continue to work with her daily, in hopes that she can become an animal ambassador for the conservation and education program in Panama. 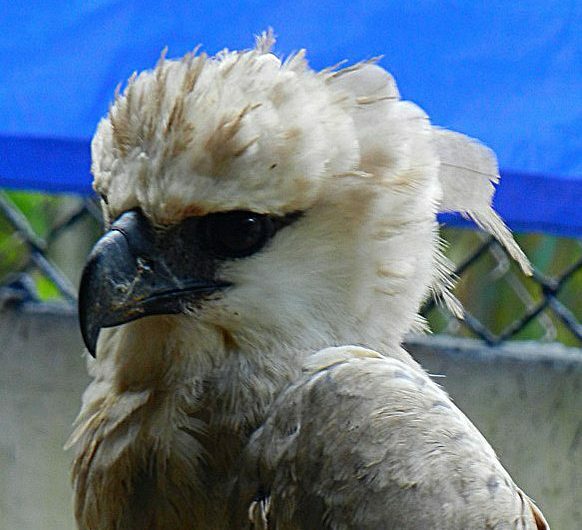 Earlier in June, Summit Park also received a 3-year-old Harpy Eagle named “Panama” from Miami Zoo, to live in the park’s state-of-the-art Harpy Eagle museum and enclosure. These two Harpy Eagles will no doubt reach out to thousands of visitors, sharing their stories and life histories to better understand their need for protection and conservation. After our visit with “Choco”, Nestor allowed us to peek at the Black Hawk-Eagle which arrived last week as well. Another large raptor of the tropics, this stunning bird behaved very differently from the Harpy Eagle. It erected its black and white crest and was very alert because of our presence. This eagle will be released in the coming weeks, once it gains weight and continues to catch live prey, which it prefers. Summit Park is surrounded by Soberanía National Park, 22,000 hectares of lowland tropical forest that supports incredible biodiversity. Fortunately, birds and animals that recover through rehabilitation and care at the park can be released on-site, where there is immediate access into the surrounding forest. The Black Hawk-Eagle, however, if all goes well, may be released from the Canopy Tower, which is within the national park. We were also introduced to a brother and sister duo—two young Gray Foxes in care who were found injured months ago in Panama City, and a 5-month-old Northern Tamandua that stole everyone’s hearts, especially Kim Kaufman’s! The group was thrilled, and thoroughly enjoyed the personal attention from Nestor and the opportunity to see the animals up close. Nestor talked about their new rehabilitation facility that will be built in the future and showed us the blueprints, donated from a facility in Florida. Sitting in his office while it rained, he continued to show us interesting things (including a young Boa Constrictor and a huge crocodile skull), and spoke very sincerely and passionately about the high level of care they strive to provide, their dedicated volunteers and staff, and their goals for the future. Everyone in the group was rather inspired! Cindy and Jim and members of the group made generous donations for the continued care of these animals and the park’s conservation program. Although they have dozens of species of animals, Summit Municipal Park does not like to refer to itself as a “zoo”, because of the poor reputation that zoos of Latin America have. Rather, it is a facility that strives to provide quality animal care, both short-term and long-term, with the support of the Government of Panama, NGOs, international organizations and zoos, and dedicated staff and volunteers. With continued support and donations, Summit Park can continue to grow its programs for wildlife rehabilitation, conservation and education in Panama, in hopes that its work and mission will extend nationally to the citizens of Panama and internationally, as the park sees thousands of visitors from other countries annually. Canopy Tower Family regularly visits Summit Municipal Park to observe birds and wildlife on the grounds of the botanical gardens, which offers excellent opportunities to see many species including Crane Hawk, Giant Cowbird, Lesser Nighthawk, a Chestnut-headed Oropendola colony, Common Tent-making Bats and more. Now, Canopy Tower Family is extending and growing our relationship and support of our neighbor, which is located just 2 kilometers from the Canopy Tower, by enriching our guests’ experiences with continued visits to the grounds of the park and occasional special visits, supporting their rehabilitation and conservation program. Furthermore, Canopy Tower Family staff member Jenn Sinasac will be bringing her experience in working with raptors to Summit Park, offering time and guidance for the care of these special birds. We will document these events with articles and photos on our website and in our newsletters. To support the work of Summit Municipal Park for the conservation of species and care of wildlife in Panama, please visit www.parquesummit.org, visit them on Facebook and follow them on Twitter. To donate to Summit Municipal Park, please contact them at parquesummit@gmail.com, or contact the Canopy Tower for more information.